The Future of Building- Panelized Homes by Davis Frame Co.
Several years ago, we saw a demand for prefab conventional homes that were not a timber frame home nor a modular home, but a high-quality prefabricated structure that can be built faster and more efficiently than a conventional stick-built home. 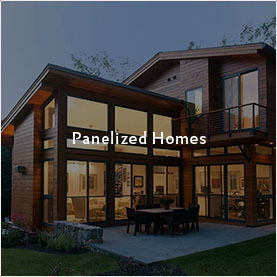 To meet this demand, we developed our prefab building system, a panelized wall and roof system that allows homeowners and builders to build a quality new custom home faster and more energy-efficiently when compared to conventional building methods. Our panelized system works well as a stand-alone structure or can offer an alternative to traditional SIPS and be incorporated with our timber frames. 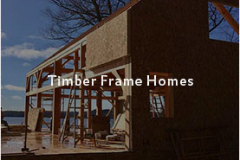 Our panelized building system can only be shipped to building locations located in the Northeast of the United States. 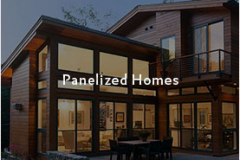 Why Use Panelized Over Other Building Methods? 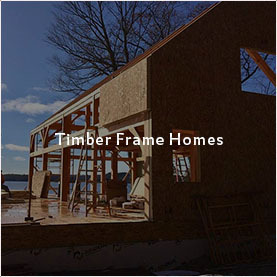 By using our panelized home system, we can pre-assemble wall panels in a controlled environment to provide you with a weather tight shell package for your new home. 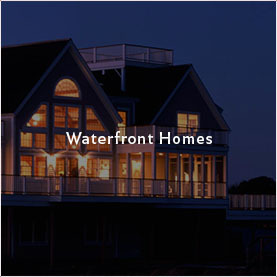 Each home is designed in our 3D CAD program that allows us to plan out all aspects of the structure before arriving on your site. By utilizing our computerized drafting and manufacturing equipment, we can guarantee quality and accurate assemblies the first time. In addition to saving labor costs and time, we can significantly reduce on-site waste removal costs while eliminating costly material overruns and delays caused by weather and material shortages. Panelized doesn’t mean your home has to be built in a box; all of our panelized homes are designed to suit our client’s lifestyle, land and budget! 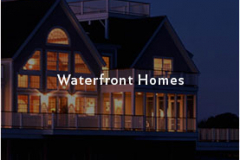 Our talented design staff is ready to develop your new custom home, so call us today at 1-800-636-0993!